We grow several types of carrots on the farm. They are usually small, as the heirlooms are not quite as large as the hybrids. Always people ask about using the carrot tops. Bunnies love them, but I did not really have an idea for anything else to do with them. 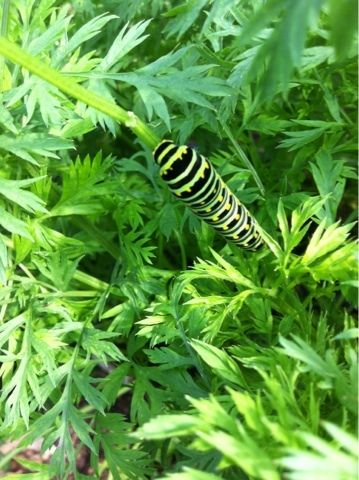 Turns out the Eastern Swallowtail Caterpillar loves them. And we love the big beautiful butterfly that this crazy looking caterpillar converts to. And so far it does not eat the carrot, just the greens: looks like we will leave a couple in the ground for these beauties!